What it's like to be a female gravity wave hunter, highlight from "The Gravity Wave Hunter"
Astrobites "Fast Radio Bursts: Shocking Neutron Stars with Black Hole Batteries", a popular summary of Mingarelli, Levin, Lazio (2015), "Fast radio bursts and radio transients from black hole batteries". Dr. Chiara Mingarelli Answers 39 Smart Questions. Then there is my invited Blog Series: Conversations with a Theoretical Astrophysicist. An interview with Megan Amram for her satirical "Experimenting with Megan Amram" webisodes. Here I talk about black holes and gravitational waves :) I enter at around 1min 40 seconds. There was a social media storm which led up to and included the announcement of the first direct detection of gravitational waves. ​This excitement caused many physicists to "chirp" for LIGO, under the hashtag #chirpforLIGO. The chirping comes from the final part of the black hole binary's coalescence, when the frequency increases dramatically, making this characteristic chirp. My colleagues and I are featured here, chirping for LIGO, in a clip featured in the New York Times. Probably Science: Episode 197 with Dr. Chiara Mingarelli! Here I talk about about low-frequency gravitational waves, pulsar timings arrays and black hole binary systems with masses that are billions of times that of the Sun. This episode was recorded before LIGO's recent announcement confirming the existence of gravitational waves. :) Enjoy! On the Titanium Physicist, we talk about Einstein's theory of gravity, black holes, how black holes "ring" and how we can detect this with gravitational waves. Here I tell the story of how I came to work in STEM, and how I almost dropped out due to imposter syndrome and a bad fit with my former Ph. D. supervisor. Thank you to the AstroMcGill club for inviting me to talk to them after giving a seminar at the McGill Space Institute. In Episode 68, I talk about how timing the rotation of pulsars can be used to detect gravitational waves---ripples in the very fabric of the cosmos. In this podcast with Cara Santa Maria, we talk about black holes, Einstein vs Newton, and gravitational waves! We also touched on STEM education, and how to develop a special relationship with Science. Interview by Meg Rosenberg for Physics Central. Summary: Scientists around the world are trying to catch some waves, some gravitational waves. Find out what these warps in space-time are, the ways to find them and how we could use them to "listen" to the movements of black holes and neutron stars. 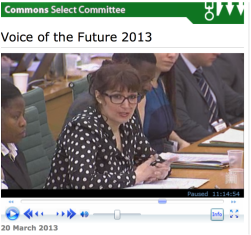 On Wednesday 20 March 2013, the Science and Technology Committee hosted a session 'Voice of the Future 2013' which is the Society of Biology’s major contribution this year’s National Science & Engineering Week 2013. The Society has a duty under its Royal Charter “to serve the public benefit” and it was in that spirit that it co-operated with the House of Commons Science and Technology Committee and with other science organisations to make this event possible. 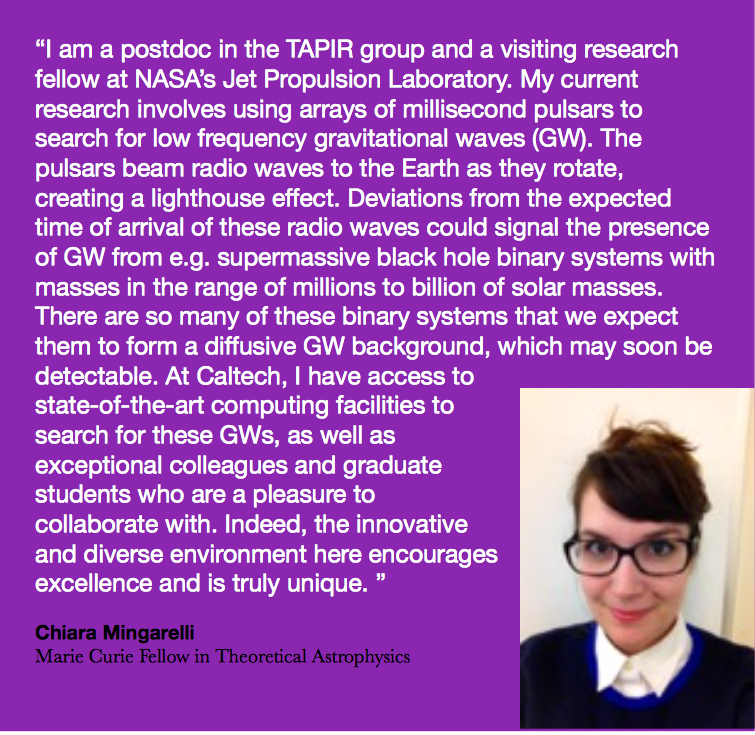 Here I talk about what a PhD student does, and what gravitational waves are. This interview was done during the run up to BBC Stargazing Live 2012. My interview with David Gregory starts at 2:30. I'm also joined by Kat Grover. 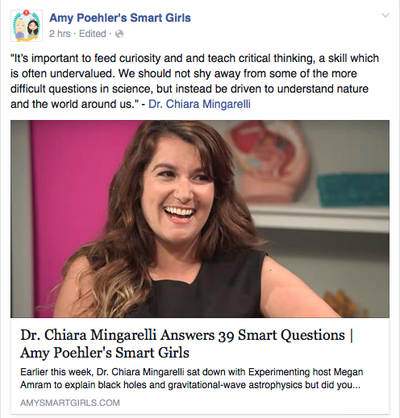 Featured in the University of Birmingham's "Alumni Profiles"
Caltech's Astronomy Brochure "The Postdoc Perspective"
March 2016: Invited Blog Series for Amy Poehler Smart Girls "Conversations with a Theoretical Astrophysicist"
March 2015: Interview by "Occupy Me", a website for career inspiration for women. March 2014: Congratulations on my MC IOF from the IoP's Women in Physics Group in their March newsletter (page 3). December 2012: College of Engineering and Physics Sciences Newsletter. Feature, page 13-14. If we ran the world (IFRTW) is an online forum where you can create an "Action Platform" and then break down your ideas into "microactions". Other members can pick these up and do them for you, helping you to complete your action. ** this article was, in opinion, ruined by rookie editors who spliced the intro and conclusion paragraph together and cut everything else out. Needless to say this was upsetting.